It turns out that there WILL be an animated version of Shakespeare's Romeo and Juliet. Gnomeo and Juliet—an adaptation of Shakespeare's famous play featuring two clans of warring garden gnomes—has been "in production" (read: kicking around various movie studios without actually going anywhere) for years, but things may actually get rolling pretty soon. It's unclear whether or not Ewan MacGregor and Judi Dench are still attached to this project, but I understand that Kate Winslet will definitely voice Juliet. I had no idea there were female garden gnomes. Of course, maybe this is a REALLY avante-garde production...? 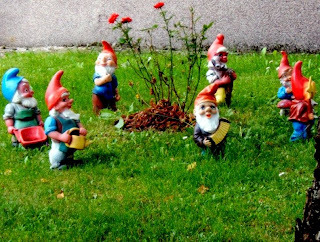 There aren't many (the female-to-male ratio of gnomes is clearly similar to that of the Smurfs), but you can find a few female gnomes. I know this because I was looking for one as a gag gift, not because I'm a crazed gnome enthusiast. I saw a work-in-progress screening of the film and participated in a post screening focus group. It looks like it will a good film.